How often do you come across a one-owner vintage vehicle? I’ve been buying and selling classics since 1977 and, until the 1990s, it was not unusual to buy a motorcycle from the original family. But these days it doesn’t happen very often. What I like about this one is that it comes with a complete history file, including its original bill-of-sale, service records, handbook, etc. This particular machine has been cherished throughout its life, and ridden continually. I’ve not added my name to the registration document, so it’s still in the original owner’s name. The purchaser of this motorcycle can therefore become the second owner. 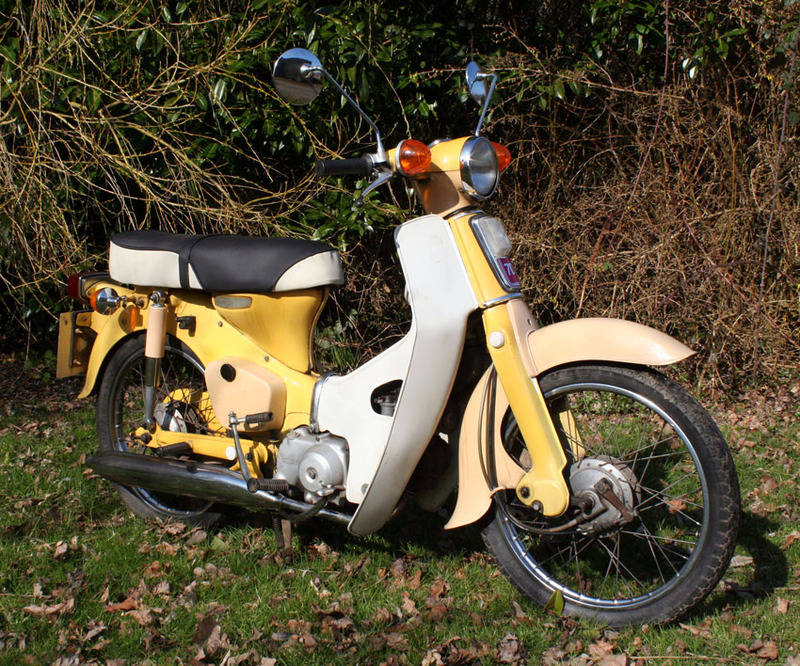 A Honda C70 is without doubt the most practical vintage motorcycle to own and ride if you want a well-designed, practical, economical and reliable 4-stroke machine. Parts are easy to find should any be required: as well as dedicated Honda parts suppliers where you can buy most mechanical components, new-old-stock body parts are available from Thailand through ebay. The Honda is very sound throughout. It was fitted with a new frame some years ago, and this has started to rust at the rear, in front of the shock absorbers, on both sides. It has not deteriorated far, and inside the rear frame is solid. If required, a local garage would charge £240 to cut out these rust patches to stop it spreading. The wheels are good. The battery is 6 volt, so it needs charging if the motorcycle is not used often. The electrics are functional, though as always with 6 volt batteries, the indicators only work when the engine is revving. My mechanic recently serviced it, a new seat cover was fitted, and it is now MOT tested until 1st March 2013. This 72cc motorcycle is ideal for riding around town, and – because of its four stroke OHC engine, arguably Honda’s best small engine – it’s nippy even with a passenger riding pillion. ‘SNR 856R’ ready to jump on and ride.